Given the projected winter weather headed our way Friday night, Saturday morning will be a great time to stay in and purchase a ticket to our pre-Lenten gathering! Presuming technology works the way we think it will (please, God! 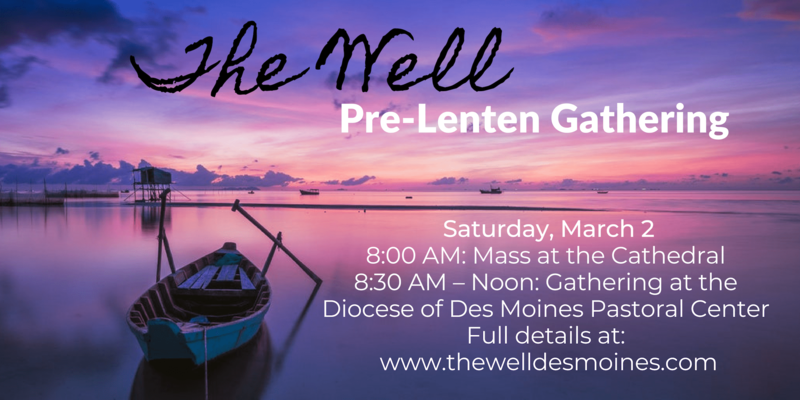 ), tickets for The Well 2019 pre-Lenten gathering will go on sale this Saturday, January 19 at 6:00AM. Beginning Saturday, January 21 at 6:00AM tickets go on sale through EventBrite. The link to register will be available on our webpage here at that time. There are two ticket categories: $25 and $30. The $30 level includes Fr. Philippe’s book Searching for and Maintaining Peace at a reduced rate. Thank you, Divine Treasures, for providing the discount! The $25 level does not include the book. About the book … It’s one of those highly recommended books all Christians should read and have in their home library. Thankfully, Divine Treasures is offering a discount to The Well. If you’re looking for something to journey with throughout Lent, we are here to spiritually walk with you. Searching for and Maintaining Peace is a short book (could probably fit in your back pocket), readable, and most appropriate for the Lenten season. Throughout the six weeks of Lent, weekly podcasts will be shared on The Water Jar Podcast featuring a team of local women offering insight and encouragement on the suggested weekly reading. A reading guide will be provided to all women who wish to join. This entry was posted in Gathering, Lent and tagged 2019 pre-Lenten Gathering, Lent. Bookmark the permalink.